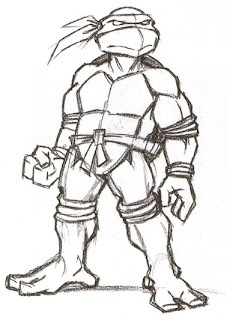 Here are some more artifacts from the early days of planning for the 4Kids TMNT tv show. 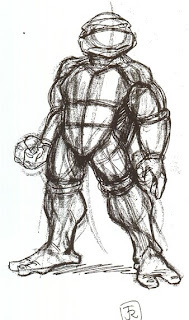 They sent me several sketches to try to work out the basic look of the Turtles as they would appear in the show, trying to keep all the essential element while giving the Turtles a look which would be unique and separate from the way they looked in the original show. What you see here are, from top to bottom, a rough pencil sketch, a tight pencil sketch, that same pencil sketch with a proposed color scheme, and finally my tweaks of that colored sketch. 1.) Remove "peaks" from top plastron segments; make them straight across top. 2 and 3.) 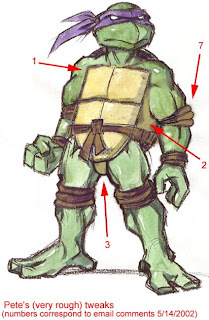 Make "connective" areas between plastron and carapace more obvious, and color them differently than either the carapace or the Turtles skin color. So cool 2 c those stuff! Thank you for keeping the knee pads brown. I thought it was a little over the top on color with the original show. Plus, it made for LOADS of animation errors. You'd be surprised how many times they where mis-colored or just plain missing all together, like with Donatello in one episode. 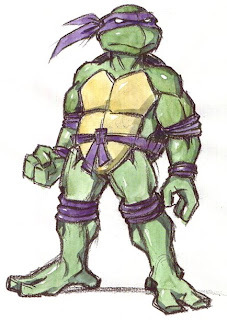 Who's idea was it to give the new turtle designs 'eyebrows', I guess is the best way to describe it? those little wavy lines dead center above the mask? I always found it distracting and it was the toughest part of the new design to get used to. Cool stuff! I love the behind-the-scenes stuff! Thank you for sharing these cool production pieces. I see they started on Donny first? -->> sessy as hell !! !! Damm unique to really how they ultimately looked !! I love seeing behind the scenes stuff like this. The finished, colored drawing is incredible. Thanks for sharing! These are really cool. I like it a lot better than the giant Justice League shoulders that the 2k3 TMNTs have. Sorry-- in a silly mood tonight.